Okay, I confess. 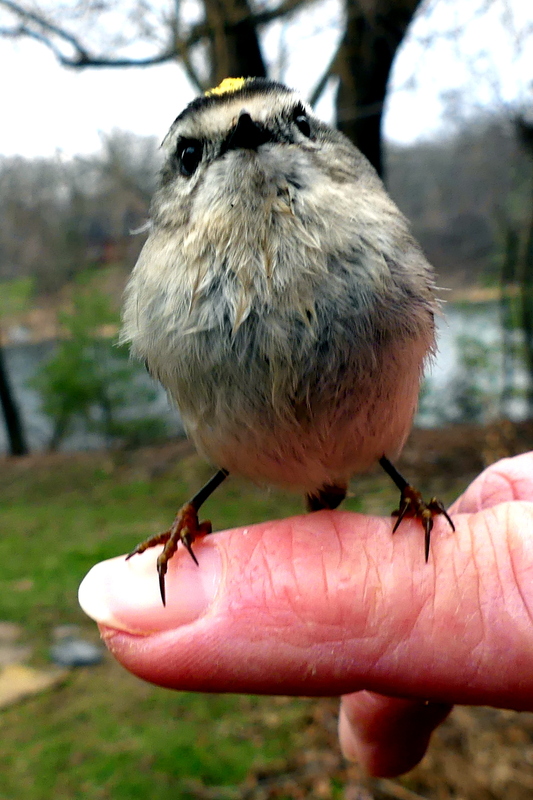 I didn’t just charm that adorable bird onto my hand. 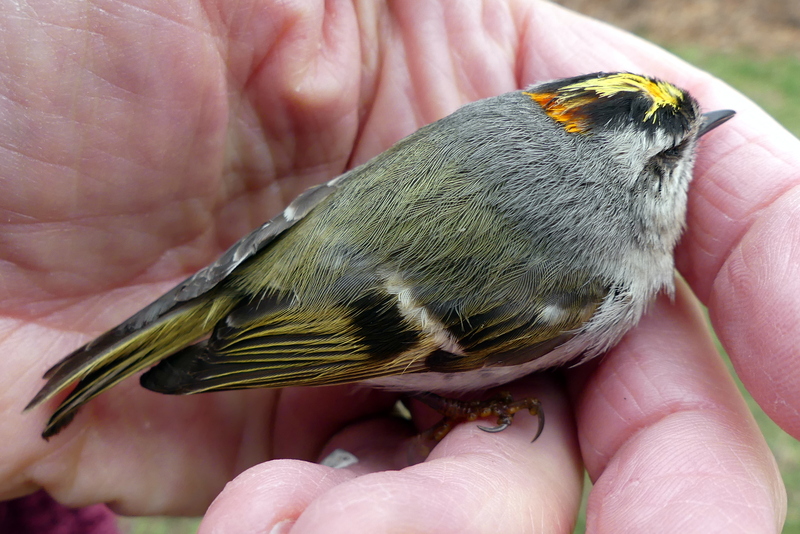 And I had no idea what it was until I looked it up later—a male golden-crowned kinglet. As sometimes happens during migration, the confused bird and his friend flew into my window. I grabbed my camera, ordered Lucky to stay in, and opened the patio door. Not surprisingly, Lucky’s cat instincts overruled my command. But her urge to play seems always to be stronger than to kill, so she gently tapped the closest bird. I was glad to see it fly off. A reprimand from me was enough to chase Lucky inside before she noticed the other bird. Lying motionless on his back, wings outspread and beak wide open, I was afraid he was a goner. 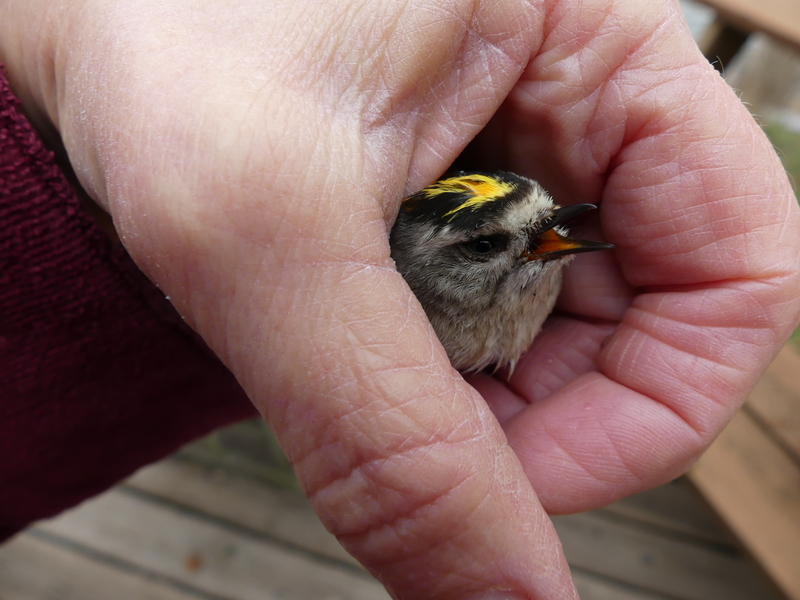 But I’ve learned that’s not usually the case, so I gently picked up the tiny thing, enclosing him in my warm hand and turning my back to the bitingly cold wind, making sure to hold him in a perching position so that he might catch his breath. It always feels like a long time, as I’m almost holding my breath while I watch to see if the bird starts breathing, but in just a minute he had closed his beak. I opened my hand but it took another minute before he was ready to hop up and started checking me out, while, yes, dropping a couple gooey gifts in my palm. Nice to know that both ends are working. A flutter of wings and turning his neck this way and that as he looked around assured me those were just fine, too, though who knows if he had a headache? Maybe just enough to make him more cautious around windows? I’m freezing out there in my bathrobe, but my little friend is feeling perkier. 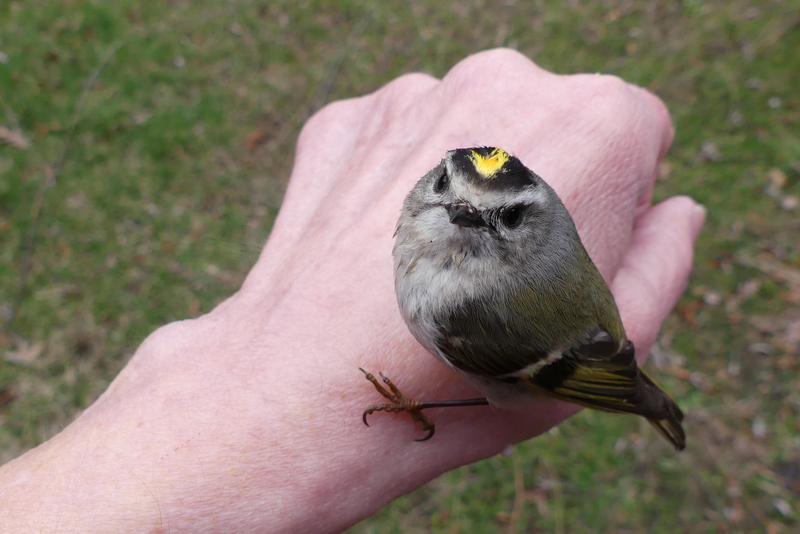 I was relieved to know he was okay, and happy to have him stay on my hand for ten minutes, even as I spoke to him and captured dozens of photos and a few videos. But I was even happier to see him fly high into my fir tree. I read that dense conifers are their favorite nesting places. Might he stay? Ten minutes after impact, he’s ready for take-off. Love those tiny toes! In the twenty years since moving into my wonderful windowful little house, I’ve had a few occasions to rescue these wayfaring strangers, and always feel they are giving more to me than I to them. As a rule, I don’t believe in interfering with Mother Nature. More often than not, critters either recover on their own, or make a good meal for a hungry predator. But a naturalist friend taught me how to help a bird breathe after an unfortunate encounter with a window, saying that their chance of survival is forty percent higher when held in a perching position to open the chest. My experience has always been that they recover, and always stay calmly on my hand for a bit. Only once did someone object to my help. 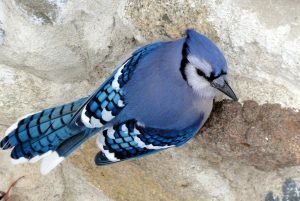 The loud bonk told me the blue jay hit hard, and there it was on the ground. It didn’t move as I approached. But when I gently picked it up, its loud squawk startled me. “Oh, I’m sorry!” I said, opening my hands as it flew just a few feet and then continued its rest. I recalled the advice never to use the Heimlich maneuver on anyone making a sound, and knew, clearly, that this bird was breathing. Good! This gorgeous blue-jay didn’t need my help – and told me so! I’ll never forget the black-and-white warbler who came a few years ago. After catching his breath, he sat on my finger, facing away from me and resting. The surprise came when he rose in the air, turned toward me, and chirped a sentence into my face, suspended there until coming back down onto my finger. Those moments were even more beautiful than his stunning plumage. Nor will I forget the robin. 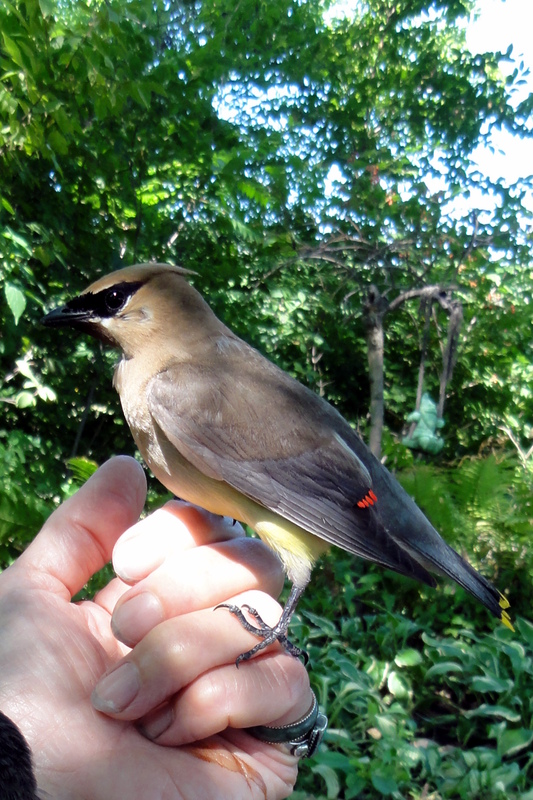 While it was resting on my finger, I sat on a bench, studying the close-up beauty of this most common of birds. It finally flew off about 15 or 20 feet, then shocked me by returning to perch on my shoulder. That took my breath away! 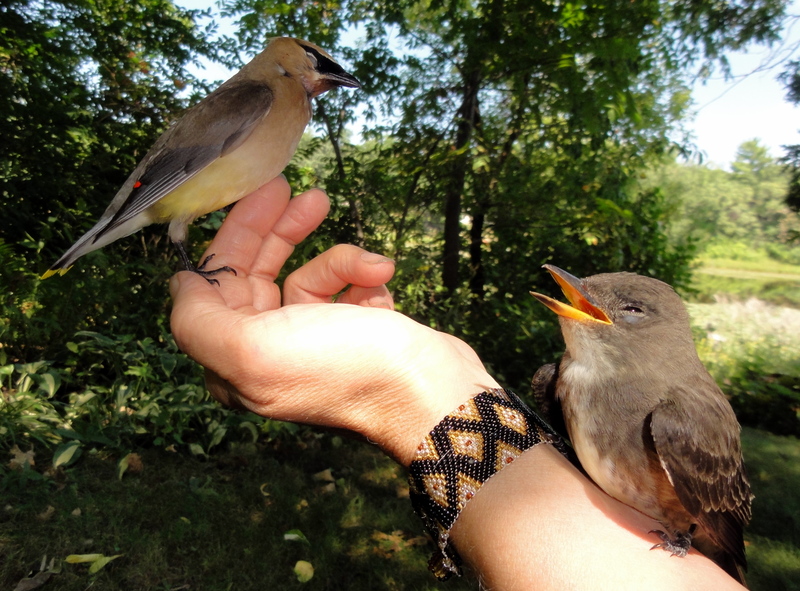 This cedar waxwing and olive-sided flycatcher hit the window together and both stayed with me a long time. People say that I draw the animals in, that they trust me. Well, animals certainly have sensitivities beyond ours, learned from eons of discerning friend from foe. Can they tell, or smell, that I’m not afraid, that I love and respect them and am not a threat? Perhaps. But I believe it also has something to do with the fact that it’s usually quiet here, and I avoid the use of chemicals. Though my lawn is small and I use an old-fashioned reel mower when I can, I do use a gas mower when needed, as well as the occasional chain saw when a tree falls. I try to time these when a neighbor is doing the same, to maximize our quiet time. But I much prefer a rake or broom to a leaf blower (click here for the facts on them) and try to keep the music I love at a reasonable level. Singing in the woods? I admit to doing that, though mostly when I hear no birds. I can’t be sure, but they don’t seem to mind, and sometimes even seem to answer. The waxwing recovered first. What a beautiful bird. When I speak on Saving Money, the Planet, and Your Sanity, I always share a slide of a bird on my finger. Quoting the old adage, “a bird in the hand is worth two in the bush,” I ask my audience to consider a bird on the hand. I believe it’s time to focus our efforts on having a sustainable, caring relationship with nature, rather than simply dominating and exploiting her gifts. 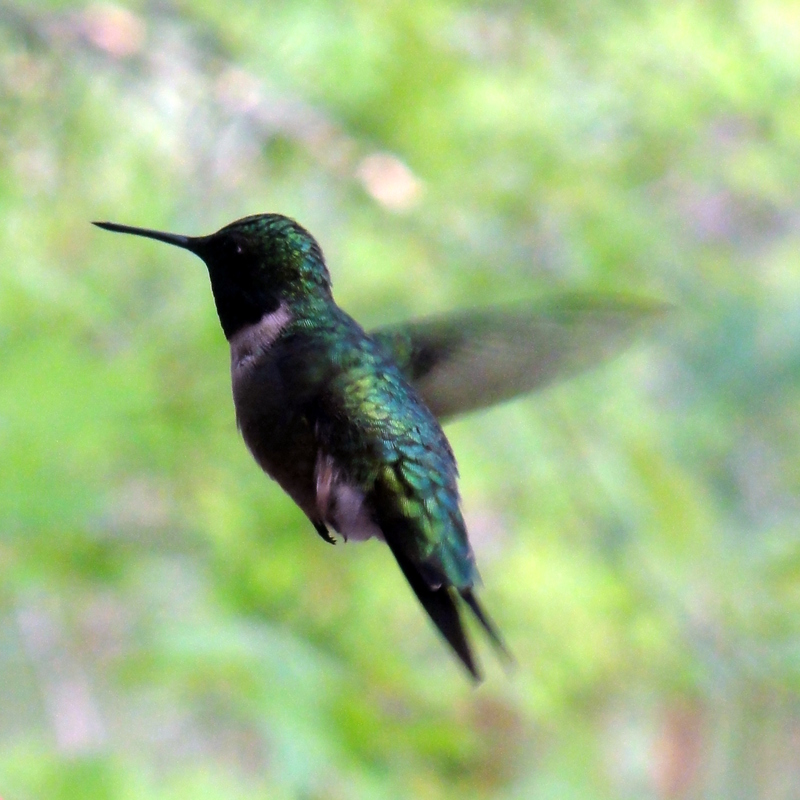 I also share a picture of a hummingbird, though it’s not on my finger. Why? While I know some love the four-ton hummer that gets ten miles to the gallon while spewing pollutants, I’m more inspired by the four-gram hummer who lives on ten calories a day and migrates from Canada to Central America while spreading joy. We have a lot to learn. 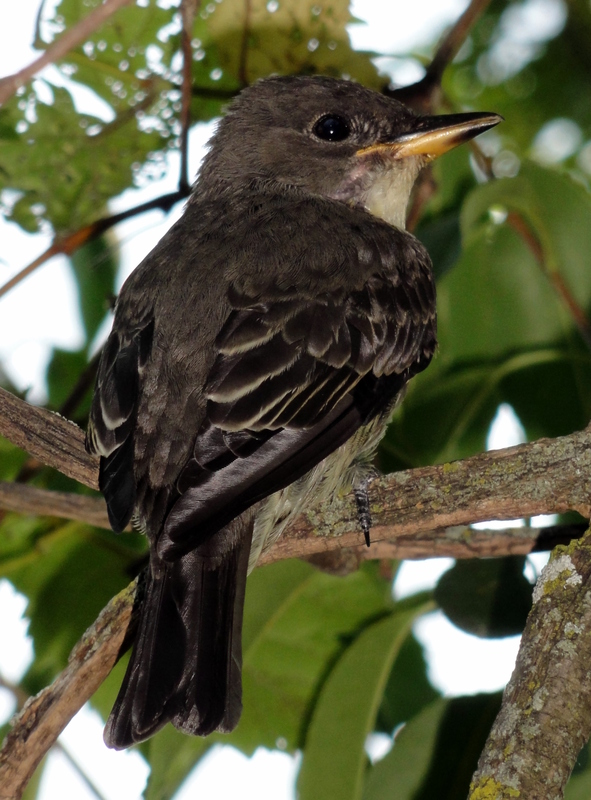 The flycatcher back where it belongs. The fuel-efficient hummer spreading joy. Holly – this is such a beautiful piece. I’m not surprised to find that you are a truly fine writer. You’re preaching to the choir here, but preach on, sister. Thank you, Marty. I always try not to “preach,” but let my true feelings come through. I hope it’s the birds and their beauty who do the preaching, complete with their heavenly voices, for they are the truth. Hi, Holly. This is Noel, using Marty’s email. What a lovely, gentle, beatific essay. I’ve become a bird watcher (and bird lover) under her tutelage, but after reading of your experiences, I realize I need to slow down more, observe more closely and keep my eye on the sparrows. And the finches. And the buntings. I’m so glad you like it, Noel. It’s very hard not to be a bird watcher when they are all around and I’m working at home. I’m still learning to spot the tiny ones, (less noticeable than the three mature bald eagles here this morning!) but I love the fairy-like qualities they have.